Plant tags contain essential information to help you make the best choices when selecting and growing different plant varieties. Understanding how to decipher a plant tag is the first step to nurturing and protecting your plants. 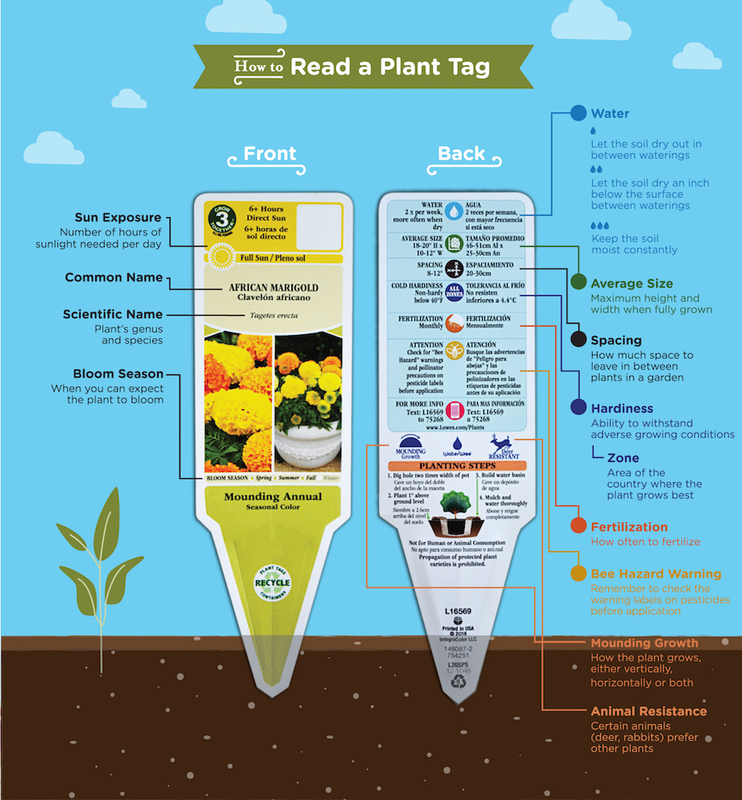 The front of the plant tag typically lists the most fundamental information about a plant, including common name, scientific name, sun exposure and bloom season. The common name is what the plant is generally called. The scientific name describes the plant’s genus, or group, and species. The scientific name can also include the cultivar, which classifies the plant even further in terms of color, leaf shape, flower type or other special attributes. Because plants may be known by different common names in different regions, the scientific name helps to prevent confusion when selecting plant varieties. Sun exposure describes the number of hours of sunlight a plant variety needs per day, and can be defined as full sun, partial sun/shade or full shade. Full-sun plants need at least six hours of direct sunlight per day. Partial-sun/shade plants need about half the amount, and full-shade plants need less than three hours of sunlight per day. Bloom cycle describes when you can expect the plant to bloom, whether in spring, summer, fall or winter. The back of the tag is devoted to more specific details about how to care for the plant, such as average size, hardiness, fertilization and water needs and animal resistance. Average size is the maximum height and width a plant is likely to reach when fully grown. Spacing describes far apart to dig planting holes when placing plants in a garden or bed. Hardiness/zone tells you in what regions a plant grows best. The hardiness of a plant describes its ability to withstand adverse growing conditions like low temperatures. The zone number indicates in which areas of the country the plant will grow best. Our trial garden in Auburn, Ala., resides in USDA Hardiness Zone 8. Hardiness/zone details generally are not cause for concern because plants sold at your local garden center should be suited for your area. However, this data is vital if you buy plants online. Fertilization indicates how often to fertilize a plant for best results, and water describes how often to water a plant variety. Water needs vary by plant variety and indicate how moist the soil around a plant’s root system should be. Some plants prefer soils to dry out between waterings while others need constant moisture. The amount of moisture a plant variety prefers is often indicated on a plant tag by water droplet icons. Animal resistance is also typically indicated by an icon. Animal resistance described as “Deer Resistant” or “Rabbit Resistant” means the animal typically will not feed on the plant indicated on the tag. An icon with a crossed-out deer or rabbit means that animal won’t nibble the plant at all. Growth refers to the maximum average size that a variety of plant will grow. This growth measurement should include both height and width. Many plant tags also include an indicator for growth habit. The term habit refers to the general shape that the plant will grow into. Some plants may be mounding with a rounded top, while others might be spreading or upright. And finally, some tags include a brief description of steps that should be taken at time of planting. These steps may vary among varieties. Now that you know how to decode their terms and icons, you can rely on plant tags to give you all the information you need to successfully choose and grow new plants anywhere.